Best friends Justin and Patrick are embarking on a very special and inspirational Camino de Santiago adventure this week. Justin dedicates his life to inspire people with disabilities to overcome challenges, enjoy life and explore the world. His childhood friend Patrick will be pushing Justin 800km along the Camino Francés, all the way from Saint Jean Pied de Port to Santiago de Compostela. Patrick and Justin will be sharing their experience on the CaminoWays.com blog every week. Let’s follow their amazing Camino journey with them…Buen Camino! Let me be completely honest with you… I am really nervous! This has been almost 2 years in the making and I can’t believe we are finally about to start on this insane adventure! And, to be doing this with my best friend is somewhat unimaginable and a little mind blowing. But, before we move on, let me give you some quick back story on how this all came about. And what I mean by “this” you will understand in just a moment. My name is Justin Skeesuck and I’m lucky to have Patrick Gray as my best friend. You see, we are not only just best friends, but we have also known each other literally our ENTIRE lives. This is because we were born just over 24 hours apart… and as I like to say, I’m the “older and wiser” one! We have grown up together, traveled together, were best men in each other’s weddings, raised our families together and live life together. I know him inside and out, just like he knows everything about me. Life was great until the age of 16 when I was in a horrible car accident which, unbeknownst to me at the time, triggered a dormant progressive autoimmune disease in my body. As the years have passed, my disease has slowly moved throughout my body to where it now has taken the use of my arms, hands and legs and I also now require the use of a motorized wheelchair to be mobile. Since the car accident, I’ve had to relearn how to do the most simple things in life over and over again, and increasingly depend more upon on others for daily living… Like getting dressed in the morning, bathing, and eating. Not a fun situation to be in, but throughout it all, alongside my amazing wife, Patrick has always been there. He’s one of those friends who I can completely rely on or I could call at a moment’s notice and I know without a doubt, he’ll be there. I’m lucky to have him in my life and would do anything for him. For years, we were planning on trying to do a unique trip together; just the two of us, but life somehow kept getting in the way. So, in the spring of 2012, I was flipping through the TV channels on a lazy Saturday afternoon when I came across a program about the Camino and I was immediately intrigued. You know, I’ve heard that some people say the Camino “calls” you… And I tend to agree with it. When I first learned about it, it was like something deep inside me was calling me to do it. Almost like I HAD to do it. A few weeks later, I showed Patrick the recorded TV episode and to my amazement his immediate response was “I’ll push you” and I knew at that very moment he was completely serious. After nearly two years of seemingly endless planning, meetings and training, we are now at the point where we are going to begin this epic journey called The Camino. 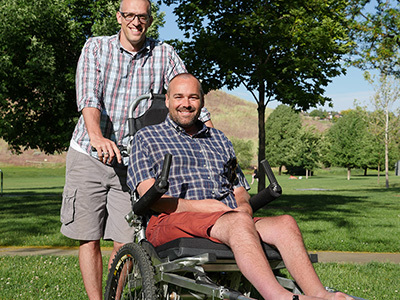 Starting June 3, 2014 from St. Jean Pied de Port, France, Patrick and I will attempt the Camino Frances or “the French way.” Using a specialized non-motorized off-road wheelchair, Patrick will be pushing me the entire 800 km… yes, this means going up and over the Pyrenees! As you can imagine, this will not be an easy task for us as I will be 100% dependent upon Patrick (and others) for every aspect of our six week long journey. From sunrise to sunset, from eating to using the restroom, Patrick will not only be pushing me in my wheelchair, but will be looking after my general health and well-being. We believe in some way, all of us have limitations. We can be limited by ailments (like mine), circumstances, perceptions, or resources. At worst, these limitations can invite despair, stagnation, or aggression. They can make us stop in our tracks if we let them. But what if we swallow pride, soften our exteriors, admit these limitations, and ask for help? Can we learn that to achieve our goals requires trust and faith in others? Even when it’s difficult to communicate with others? Can you imagine what is possible? I can and I hope that even with the immense challenges that Patrick and I are about to face, we will be open to whatever the Camino brings us. We look forward to seeing what wonderful people we will meet along the way and how the journey unfolds before our very eyes. Additionally, we hope that you can follow along our journey as we will be posting our hardships, joys, moments of immense obstacles and success on the road to Santiago here at CaminoWays.com. So stay tuned and until next time… Buen Camino! Hi John, thank you for your message. I will reach out to Patrick and Justin to see if they can offer some advice. You will need help along the way but anything is achievable if you put your mind to it and the Camino is a beautiful journey. Kindest regards, Lisa. I have a severe neurological condition that has me limited to a wheelchair. I am 52 and have been hearing about the Camino repeatedly over the past 6 months. I am taking this as a spiritual calling. I need advice on how to accomplish this pilgrimage. OMG – You both are totally amazing and I am so inspired by what did. You have such a true friendship! I did the same El Camino starting in April of 2014 and totally understand how difficult it can be with the many challenges along the trail. You definitely are an inspiration to anyone that has a disability showing them anything is possible. As I loved my experience on the El Camino so much, this coming fall I am going to go back and do the Portugal El Camino. Thanks so much for sharing your experience and friendship! I had Guillaine Barre 6 years ago. I struggle to walk. I am mostly in my wheelchair. I also have Generalized Anxiety Disorder, yet I have wanted to do the Camino for decades. Can I still? Yes…I think now is the time. Been married 49 years. 70yrs old. Need pusher. Wife has post polio and is housebound. Thanks too for your personal sharing. It can be hard to know what to keep between yourselves and God but you seem to have nailed it. Thank you! Buen camino. Your Forward moved me to tears. I’ve taken three years to walk the Camino and finished on the 18th June this year. The Camino is the start and it changes the way we look at the World. I call it a “stream of consciousness.” We confront ourselves on the Camino and that’s a good thing. I’m so glad I read this.